Spondylosis in dogs, also known as spondylosis deformans, is a degenerative condition of the spine that is characterized by the development of bone spurs along the vertebrae. The condition usually affects older dogs, but may also develop in response to injury. Most often, spondylosis appears behind the chest and on the upper vertebrae or lower back. Larger breeds are at greater risk for developing the condition. Depending on the size and location of the bone spurs, dogs may feel minimal symptoms, or they may start to experience nerve damage and mobility issues. Because of this, some dogs require extensive treatment or surgery, while others can be treated as outpatients and have their symptoms managed with medication and monitoring. If you see the signs of spondylosis in your dog, consult your veterinarian so they can decide on a proper course of treatment and monitor the condition’s progress. 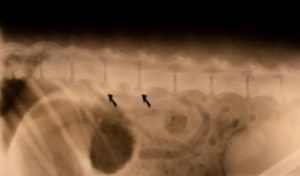 Here’s what you should know about the symptoms, causes, and treatments for spondylosis in dogs. Most dogs who have spondylosis are asymptomatic, meaning they show no outward symptoms at all. Usually, bone growths can be felt by touching dogs along the spine before they show any other signs of having the condition. However, depending on the location of the bone spurs and where they are located, the following symptoms may appear. Spondylosis in dogs often develops in old age, usually around or after the age of ten years old. This is because the bones and joints of older dogs have had more time to go through natural wear and tear. Repetitive stress can cause the joints to degenerate and lose stability, and the dog’s body responds by growing new bone to strengthen these areas. This can also happen when there is injury to the joints. The body responds in the same way, by growing bone to make up for the damage. Poor nutrition, stress, and a lack of exercise may also contribute to the condition. Some dogs, especially larger breeds, are more predisposed to growing spurs, and are more likely to develop spondylosis. Treatment of spondylosis in dogs is based on the severity of the symptoms. In most cases, dogs show no clinical signs associated with the bone spurs and, therefore, do not require any treatment at all. Dogs that experience minor symptoms may be prescribed pain medications or anti-inflammatory drugs. Often physical therapy and exercise programs can help, as well as monitoring weight and potentially implementing a weight loss program, as this will ease stress on the spine. Some veterinarians may recommend acupuncture as a treatment. In rare cases where the bone spurs are causing nerve or tissue damage and severe pain, surgery may be an option to remove them. No matter how severe or mild the condition is, regular follow-up visits and monitoring should continue to make sure symptoms don’t appear or worsen.